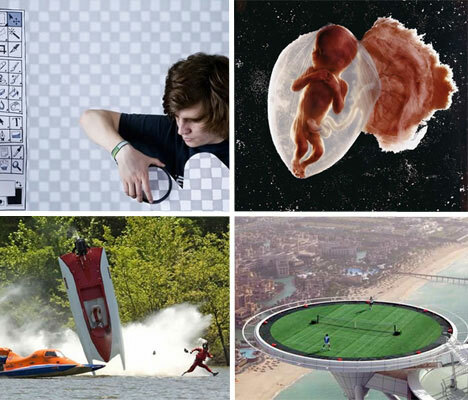 A man walking on water, a bunny the size of a dog and a fetus floating in a starry sky – none of these things can actually be real, right? In an age when almost anyone can effectively manipulate images in Photoshop, it’s easy to scoff at every incredible photograph that you see on the internet. Don’t let your cynicism get the best of you. Some are the result of sheer dumb luck, others from hours of careful preparation and some exist because reality is simply stranger than fiction, but these 15 images are 100% authentic. Speedboat driver Joe Peroceschi walked on water… sort of. 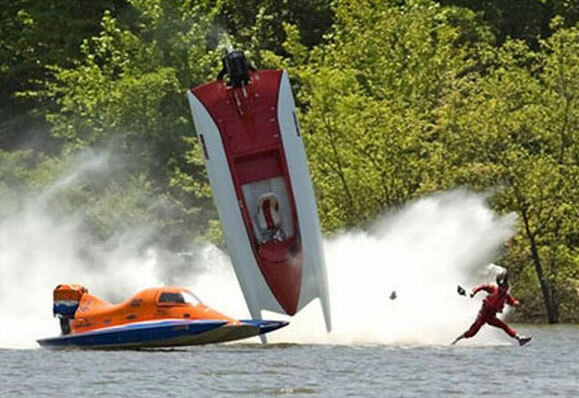 After windy conditions caused his boat, Smokin Joe, to flip during the Budweiser Drag Boat Nationals race on Wappapello Lake in Missouri, Peroceschi appeared in photos to be momentarily running across the surface of the water. In reality, he was about to get hit by a competing boat. Miraculously, Peroceschi survived to walk again. 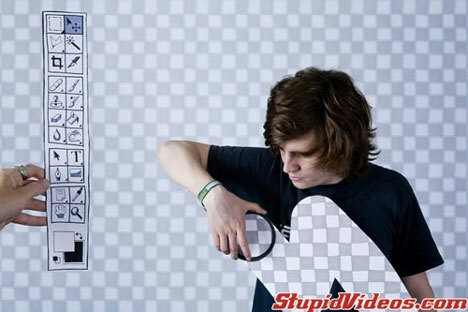 Using a couple cardboard props and a checkered background, this photographer imitated the look of a photoshopped image in progress, seemingly using the eraser tool on himself. Impeccably lined up with the background, it’s difficult to tell at first that this isn’t an image in the process of being edited. Driving through a parking garage and seeing words floating around might lead you to think that perhaps someone put a little something in your drink. 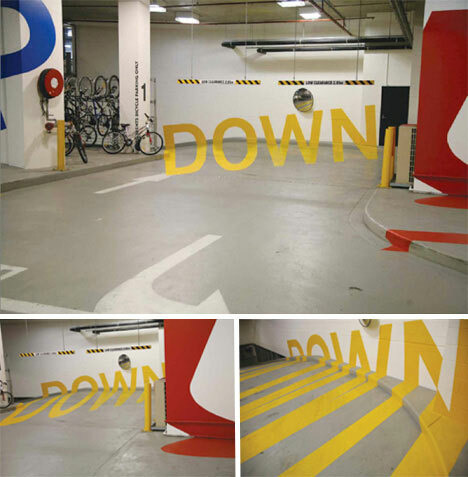 Graphic designer Axel Peemöller painstakingly painted distorted letters on the walls, floors and beams of a Melbourne, Australia parking garage so that when you stand in the right spot, they seem to hover in mid-air. 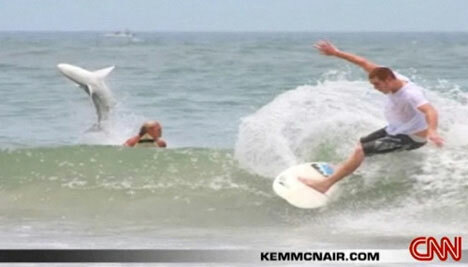 A CNN photographer just happened to snap a photo in the right place at the right time, capturing a spinner shark jumping out of the water in New Smyrna Beach, Florida just yards behind two oblivious surfers. Don’t believe it? CNN has video showing additional images and testimony of witnesses. 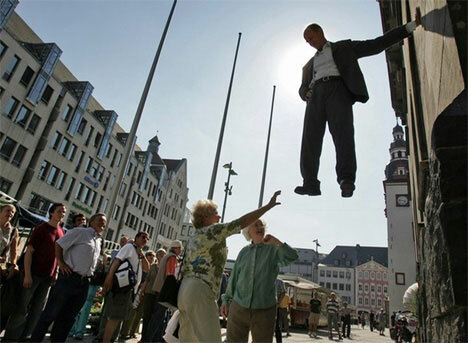 Like Li Wei, Johan Lorbeer puts on seemingly gravity-defying public performances, hovering above the ground with one hand against a wall for hours at a time. He’s surrounded by puzzled onlookers who just can’t figure out how he does it. His secret? A fake arm connected to a harness. His real arm is hidden inside his clothes. 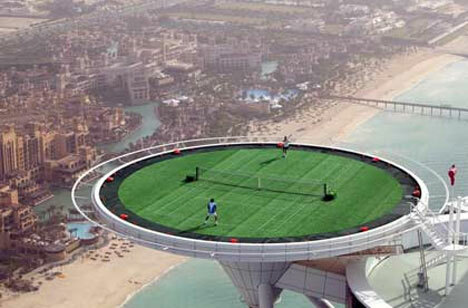 Surely, those guys aren’t really playing tennis that high in the air, right? Well, yeah – and ‘those guys’ are Andre Agassi and Roger Federer. The too-crazy-to-be-real setting is actually a helipad at the Burj Al Arab hotel in Dubai. Good thing these two tennis greats aren’t afraid of heights. Can a Bunny Really be This Insanely Huge? This photograph is one of many that have been circulated around the internet to instant cries of “Photoshopped!” But, believe it or not, rabbits this big do exist. Seriously. There’s video. 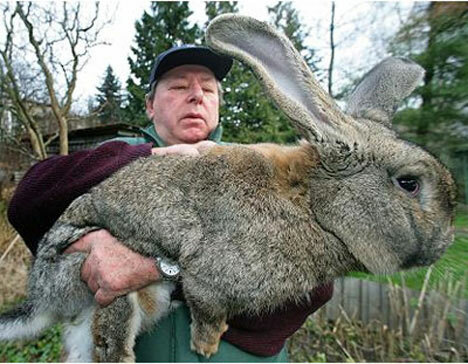 These giant rabbits are bred in Germany by Karl Szmolinsky – as a source of meat for the North Korean population. You can’t make this stuff up. 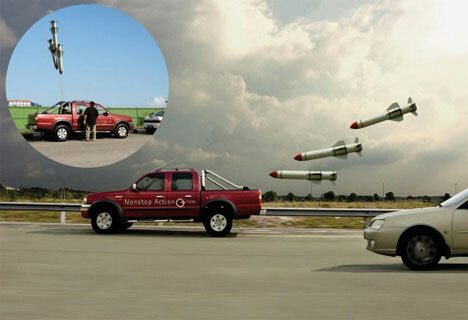 Without the little inset photo, in which you can see the tethers, this photo of a truck being chased down a highway by missiles would be pretty hard to swallow. But, the missiles are just harmless balloons. 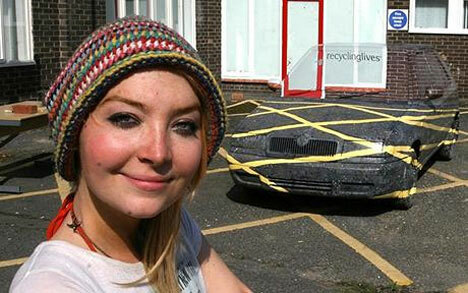 The ‘Missile Car’ was an entry in the 2009 Cannes Lions International Advertising Festival. 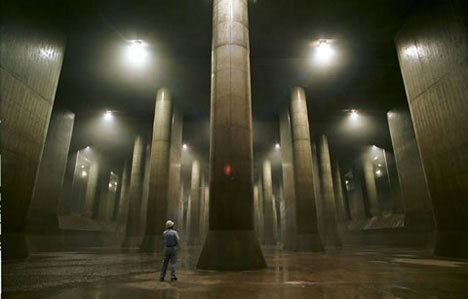 A science fiction movie could easily be shot in Japan’s underground flood tunnels. The reflective floors, endless rows of towering pillars and eerie lighting makes the G-CANS project look like something out of this world. It consists of five concrete containment silos that prevent overflow of the city’s major waterways and rivers during rain and typhoon seasons. 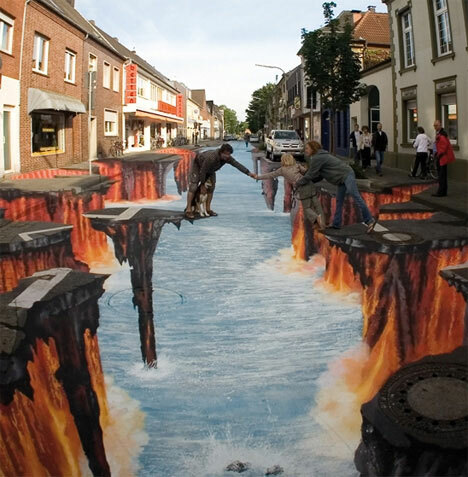 Street artist Edgar Mueller is a master of optical illusion, creating chalk drawings on pavement and other surfaces that transform the space into something altogether different. This post-apocalyptic scene of a German street disintegrating into a churning sea is just one example of Mueller’s many jaw-dropping street scenes. Mueller’s work relies on the viewer to stand in just the right spot to see the illusion. A guitar store in Southampton, England found a brilliant way to not only make its security gate more attractive, but announce what it sells in the most gleefully attention-grabbing way possible. 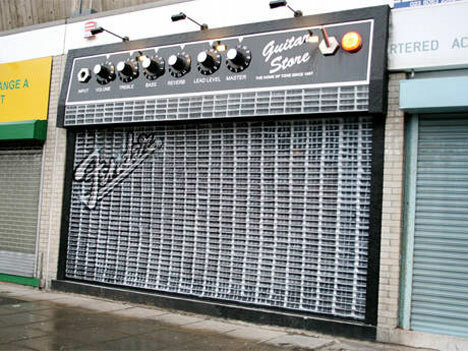 A Fender logo adorns the gate and a sign above the store is complete with controls turned all the way up to 11. It’s hard to tell at first whether you’re looking at a flower that looks like a mantis or a mantis that looks like a flower. 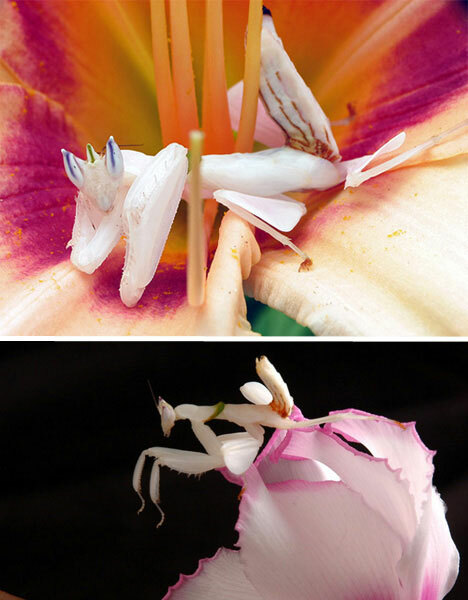 In fact, the orchid mantis is a rainforest insect whose legs resemble flower petals and coloring perfectly matches that of the flowers it is often found hiding inside. 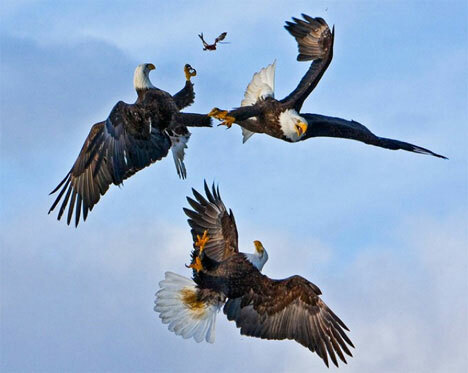 What looks like a somewhat cheesy patriotic digital image created by a computer is a real photograph of three eagles fighting over a fish in Homer, Alaska taken in March 2008 by photographer Jose Hernandez. This incredible image was one of the winners in the National Geographic 2008 International Photography Contest. 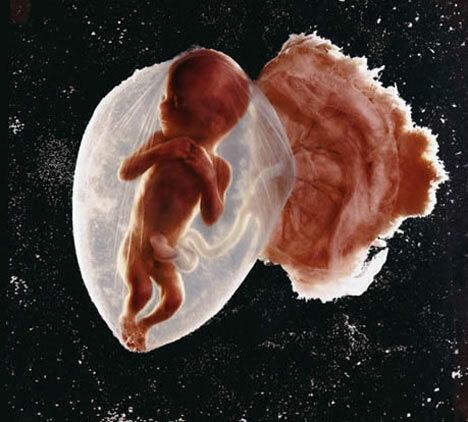 A fetus, still in its gestational sac and attached to the placenta, floats eerily against a starry background. But this is no collage, no matter how unreal it seems. It’s an actual living fetus taken inside a pregnant woman’s uterus with an endoscope. When Lennart Wilson showed it to LIFE Magazine’s editors in 1965, they demanded witnesses to prove that it was real. It remains one of the magazine’s most iconic cover images.